Today will be the day. I lifted my heavy legs off the bed and swung them around to the wooden floor. Making certain that they were firmly rooted I rose carefully, only to be greeted by a wave-like sensation. Was the floor swaying or was it just me? I quickly realized the obvious. Jet lag! No, today would not be the day. Nor would it be the next day. There would be no blogging. None. It would have to wait until the dense fog of travel had lifted. I would need to be patient. It took longer than I expected. That fog would last almost two weeks. After a three-week trip to the watery world of Venice, my body and brain were still in another realm and they had no desire to return to terra firma or our home in California. Oh, there was the obvious jet lag that is natural with a nine-hour shift in time zones. Rising at 3:00 AM and eating lunch at 8:00 AM is fun for about a day. On the third day it tends to bog one down. Looking out the window to an endless morning of darkness is a downer. But the cloud in which I was emerged was more complicated than simple jet lag. 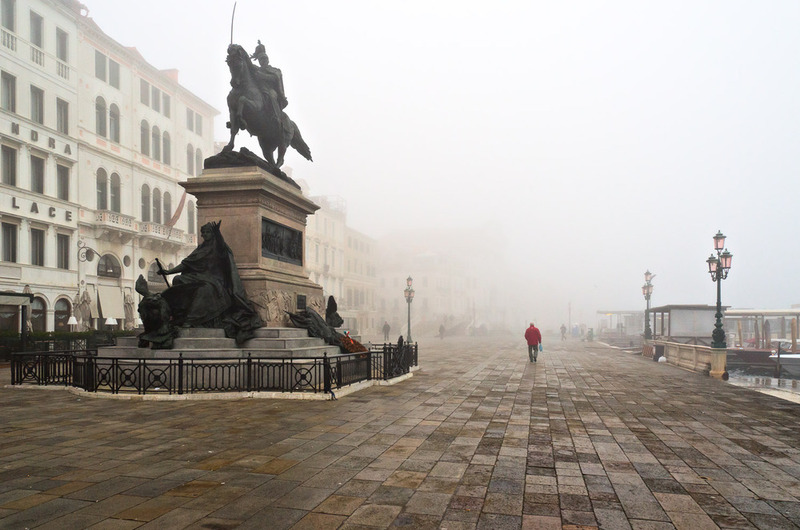 I missed the Venetian life I'd adopted and I was now grieving its loss. This morning I finally awoke to a steady floor and firm constitution. One can grieve the end of a fabulous vacation for only so long. Once I started to annoy myself with my lamenting and brooding I knew I was back. It was time to get down to work and get down to blogging and art-making. And so, on this misty California morning I am solidly here again, back at the desk in my beloved and cozy cave of an office. Sifting through some 6000 new images and a tangle of new memories would be the first task at hand. Digital photography encourages us to be prolific but managing so many images and organizing them within an already huge image library takes time. The best photos emerged slowly from the murk. Did I really need to click the shutter ten times for every single subject? There's a lot of noise in a field of 6000 images. Finding the best takes time and coaxing. And then the image edits take even longer. Working on travel photos is akin to the unfolding memories of the trip itself. So much happens to the senses that the brain can't keep up with it all. The memories get packed in and there's little time to process any of it. Once back in familiar territory it all starts to expand, like an accordion whose bellows are slowly being opened and its resulting tones emerging as a result. Memories mingle with images as the trip is reconstructed in ways both sweet and melancholy. Was I really standing there at the Grand Canal just a week ago? And so, after a long hiatus things are returning to normal again. But my view of the world has yet again been altered. I look at my home and myself with a new perspective and with fresh insight. There is a backlog of work to be done and I'm finally ready to do it. Yet I gaze longingly at the horizon out of the corner of my eye, counting the days until I can yet again return to my beloved Venice. The new images will appear here in the blog and in other galleries on the Mark Lindsay Art website.